Where else can you ride a pig with Mario and Luigi cats? Last week we reported that Monster Hunter 4 sold a staggering 1.7 million retail units in just two days, a figure not too far off two million when estimated download sales were also considered. In its first full week and its second appearance on the Media Create Japanese software chart it's continued that strong form, selling a further 473,739 physical copes in Capcom's homeland. Sales of 3DS hardware remained above their average, though fell away overall in proportion with the sales of Monster Hunter 4 — still mightily impressive figures, nevertheless. The Wii U still awaits its surge of new software and attractive hardware bundles due on 31st October, but nevertheless crept above the PS Vita; sales of Sony's portable fell, possibly, in anticipation of a reduced price model in early October and November's Vita TV. Last week's sales are in parenthesis, below. Monster Hunter 4 continues its relentless march to smash Capcom's sales target, and we keep hoping and praying for localisation. 3DS sales are likely to continue strongly for a good while with some massive titles on the way, while Wii U will be hoping for a substantial turnaround with its upcoming content. Those are some beautiful numbers for MH4. I still can't believe the original wii is still outselling the Xbox360 and we never hear about it, just how bad WiiU is selling and it's beating Vita! The 3DS is really kicking some donkey though......look at him go! 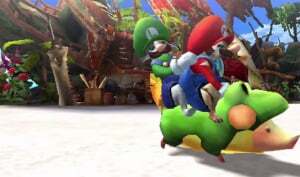 Really looking forward to playing MH4 it can't get localised quick enough! Makes sense. MH is an awesome franchise. Looking at just the weekly number, Monster Hunter 4 is outselling the rest of this list combined, times 4, on it's own lol. That's impressive. WiiU should see a small surge with WWHD releasing in Japan tomorrow, and 3DS is two weeks away from another sales explosion. Good times. Crazy. It'll reach 4 million easily, probably in a matter of weeks. The 3DS install base is already pretty big so no surprise the numbers fell but still great sales nonetheless. Price drop was likely the reason for the WiiU boost, I'm looking forward to seeing what the new bundles will do for it. @PrincessSugoi Japan isn't getting the price drop! Just wait till Pokemon and Zelda hit the 3ds. Zelda will still do better in the west for some reason!? I just hope the insane numbers convince Capcom to do something a little special for Wii U. @spoony_tech The new Wii U bundles in Japan look much better value than what was around already. I am not sure when they're launched but I think they'll improve sales by more than a few hundred. It does look pretty bleak at the moment. I do worry that they'll sideline the console if they can't turn it around soon and we'll be waiting til 2018 for the next one! @Spoony_Tech My bad, thought they did. That makes the upward trend a bit more promising then. I love how they have the large 3ds and small broken out separately, like they are different consoles. Keep the software coming. Any word yet on a Japanese 2DS? If it's supposed to be good why wouldn't Nintendo release it in Japan? Those Wii U numbers are starting to depress me. I know the PS3 has more games an dis cheaper, but it's also been out for 6 years - everybody in Japan should already own 1. A new 10 month old system should be outselling a 6 year old one at some point. I guess not having any games in the top 20 doesn't help. I wonder if Vita TV will outsell Wii U this holiday? (Assuming Japan has a "holiday", I guess that's a big assumption on my part) What else new is there? @Darel18 Not out til October 10th in Japan. That's still pretty amazing turnaround time for translation. Look how long we have to wait for games like Monster Hunter which have far less text and audio. @Peach64 Monster Hunter 4 has a ton more text than previous games. And previous games had tons of text which were mostly concentrated in the item carves or monster parts. Audio does not need to be changed in most cases though. Just wait until X and Y come out. Not sure why they would wait on the new vita, as it's just a 1000 yen drop from the previous model. That 1 gb internal memory might be the reason though. @KingofSaiyans No it does not. Although I would be open to such a feature if it only transferred character name, looks, and voice. Other things such as items cannot be transferred over due to the games new weapons and rebalancing of skills and armor sets. Oh and the removal of some monsters and replacing them with others. Watching Monster Hunter 4 for the 3DS on youtube and reading the comments is interesting. You can tell that players are upset that it's not on PS3 or XBOX. @KingofSaiyans you may want to rethink that since it could be a long time before the next game gets localized. If it would be at all. Capcom is not in a great financial position and monster hunter doesn't sell the same in the west. It could be as little as a year wait or more. Aww yeah!!! Lets go, 3DS!!!!!!!!! Good for the 3DS! But am I the only one who thinks MH4 should have been on the Wii U since the Wii U needs help (dire help). If I had extra cash I would be real tempted to buy the import 3ds, and this game. @real_gamer Handhelds are way more popular in Japan and would sell better which capcom desperately needs to do right now. Insane numbers. And an awesome screenshot! I need this game, like, right now! Im happy its doing so good. Bring it ooooon. MH 4 has already beaten MK 7 and N.SMB 2 lifetime sales! Although, Mario games have always been good steady sellers throughout the console lifespan. This remind me... Better pre-order my Pokémon X! It outsold MK 7 in just 2 weeks? My god. @Moshugan: Apparently Pokemon X/Y has surpassed a million preorders! I'm seriously wondering if I should as well.